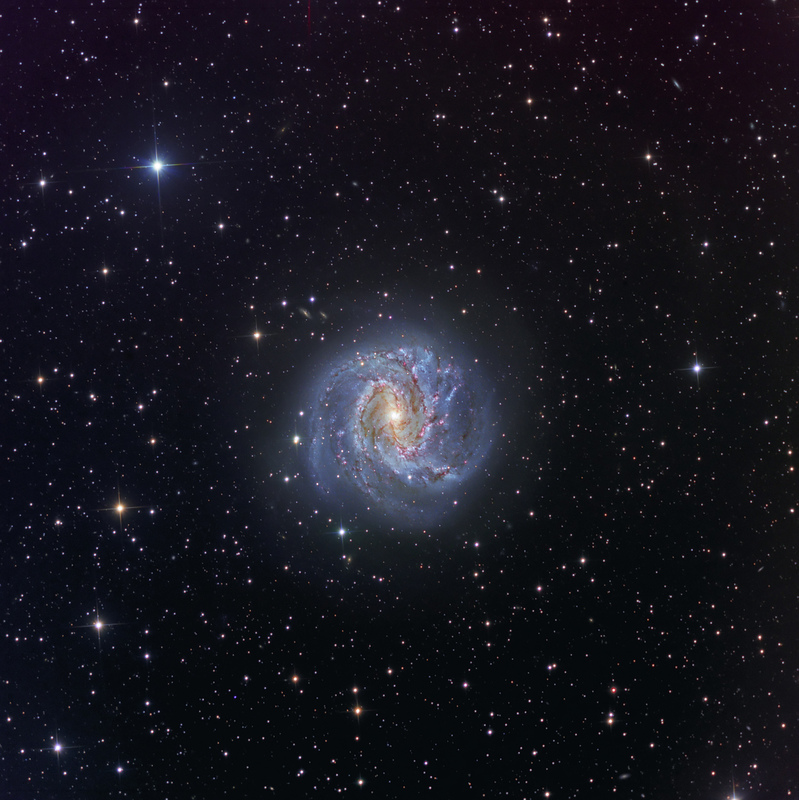 M83, The Southern Pinwheel Galaxy, is a bright, mag. 7.6 galaxy in the southern constellation of Hydra at RA 13h 37.0m and DEC -29d 52m. It is the southern-most galaxy in the Messier catalog. It was the third of all galaxies to be discovered. de Lacaille discovered it in 1752 from the Cape of Good Hope. Messier added it to his catalog in 1781, but with great difficulty, as it was so difficult to see from the northern lattitude of Paris. It was classified by de Vancouleurs as an SAB(s)c galaxy, intermediate between a normal and "barred" spiral. Its well-defined arms are dotted with pink HII regions and new blue stars. Dark dust lanes are pronounced, spiral around and into the core, which contains an older, yellow star population. It is 15 million light years distant. There have been 6 supernovas discovered in M83 in the past ~90 years. Only NGC 6946 has more. The image above is ~ 40 x 40′ and North is toward the upper right corner.